I feel so much better today! Sleeping 25 hours out of the last 36 will do that, I suppose. My boss thinks my “hibernation” sick-day method is intense, but you can’t beat the results. My throat is barely sore and I can breathe out my nose again. 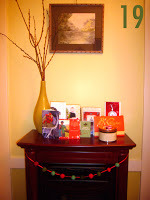 For the few hours I was awake yesterday, I enjoyed the little fireplace set-up we have in the living room. That beaded garland is from the November LAC felting project.